(CNN) — A woman died while riding a roller coaster at Six Flags Over Texas in Arlington, though the circumstances behind it remain unknown. Six Flags confirmed that a woman died while riding the Texas Giant roller coaster Friday, but did not provide details further details. "Since the safety of our guests and employees in our number one priority, the ride has been closed pending further investigation," the theme park said in a statement. Park medical staff and local paramedics responded immediately to the scene, the park said. Gabe Flores said he was next in line at the amusement park. "Me and my girlfriend were at the gates and the next ones to get on the ride … the cars came in and there was a man and a woman in the front," he said. "The man was saying, 'let me out, let me out, my mom fell off.' "
The man and woman were distraught and speaking in raised tones, said Flores, who lives in Benton, Texas. "There's a turn that's pretty steep, and the person behind her empty seat said she fell out there—just flew out," he said. Flores did not see her fall, but park visitors told CNN affiliate WFAA they did. "She goes up like this," Carmen Brown told the affiliate, raising her hand up in the air. "Then when it drops to come down, that's when it released and she just tumbled." Brown told the Dallas Morning News that the woman had expressed concern to a park employee that she was not properly secured in her seat. "He was basically nonchalant," Brown said. "He was, like, 'As long as you heard it click, you're fine.' Hers was the only one that went down once, and she didn't feel safe. But they let her still get on the ride." Six Flags Over Texas spokeswoman Sharon Parker said the park is committed to determining exactly what happened. "It would be a disservice to the family to speculate regarding what transpired," she said. "When we have new information to provide, we will do so." The Arlington Police Department did not immediately respond to a CNN request. The affiliate said police are investigating whether the woman suffered a medical emergency before the fall. 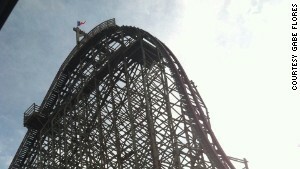 The Texas Giant was originally designed in 1990 as an all wooden roller coaster. It was redesigned with a steel track and reopened in April 2011 to mark the theme park's 50th anniversary. At its highest point, the roller coaster is 153 feet and has a drop of 147 feet, according to the theme park. Elsewhere, seven people suffered minor injuries in a boat-ride mishap at the Cedar Point amusement park in Sandusky, Ohio, park officials said. The incident occurred Friday evening when a boat rolled backward down a lift hill on the Shoot the Rapids ride, park spokesman Bryan Edwards said in an e-mailed statement. The seven people in the boat were evaluated and treated by Cedar Point emergency medical staff, Edwards said. One of the seven was taken to an area hospital for additional evaluation and was subsequently released, he said. The ride will remain closed until Ohio park officials and inspectors review it.